Fusing French chic with a soupçon of Californian 'West Coast cool', Jouer Cosmetics are purveyors of the most-wanted maquillage this side of paradise. Part of Jouer’s new skin care line, this luxe Overnight Conditioning & Repairing Lip Mask deeply nourishes lips overnight or during day, revealing a full and plumped up finish with diminished lines, chap or dry patches – the perfect pre-treatment before applying your favourite eye-catching lipstick! A luxe leave-on mask that can be worn during the day or night to help replenish and rejuvenate dry and chapped lips, this clear soothing balm instantly surges lips with good-to-skin ingredients that impart much needed moisture and hydration that will leave them looking baby soft come morning. 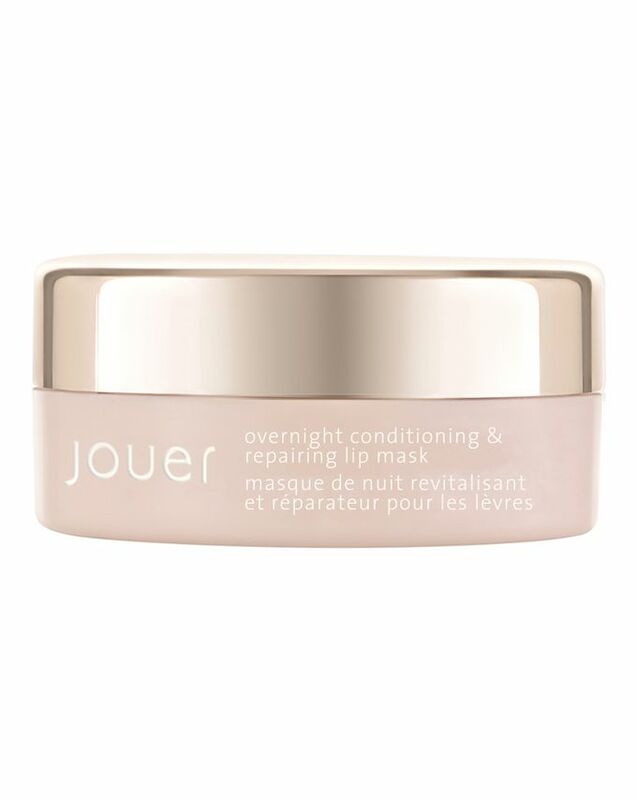 Formulated with shea butter and jojoba seed oil this Overnight Conditioning & Repairing Lip Mask brings dry, flaky lips back to life with their hydrating and nourishing properties. The inclusion of hyaluronic acid, grapeseed oil and vitamin E helps to lock in moisture and leave lips feeling soft, smooth and supple. Use your finger to apply a generous layer on the lips and leave on overnight. Remove by gently wiping off or cleansing in the morning. Use with Smoothing Sugar Lip Scrub. Diisostearyl Malate, Cera Microcristallina/Microcrystalline Wax/Cire Microcristalline, Hydrogenated Poly(C6-14 Olefin), Polybutene, Candelilla Cera/Euphorbia Cerifera (Candelilla) Wax/Cire de Candelilla, Ethylhexyl Palmitate, Phenoxyethanol, Butyrospermum Parkii (Shea) Butter, Aroma/Flavor, Tribehenin, Hydroxystearic/Linolenic/Linoleic Polyglycerides, Simmondsia Chinensis (Jojoba) Seed Oil, Tocopherol, Vitis Vinifera (Grape) Seed Oil, Sorbitan Isostearate, Lactic Acid, Palmitoyl Tripeptide-1, Ricinus Communis (Castor) Seed Oil, Sodium Hyaluronate, Hydrogenated Castor Oil, Citric Acid, Benzyl Benzoate. I really disagree with the first review because the amount of this mask is huge! Rare lip mask have such an amount and not only in numbers but the actual product you get is a lot. Really creamy, smooth and soft. I love it. Good at repairing dry and chapped lips. I would definitely recommend! Good product, not a good price. Smell and texture is pleasing - vanilla and not too thick or sticky at all. Results are a bit above average, my lips do feel softer and slightly plumped. However, I would not repurchase as it’s a tiny amount for the price you pay. There are much better alternatives out there.